Does our clothes show our wealth and status? Well it did in medieval China. Back then the garments and materials you wore were clearly laid down so that rank and social position was obvious. Those who were at the lower end of the spectrum wore clothing made from hemp and other vegetable fibres. But as you rose up the hierarchy you got to the silk brigade. Whether you were nobility, high up in the civil service or serving in the barmy you showed your position with a rank panel on the front of your robe. That was true of ladies was well. 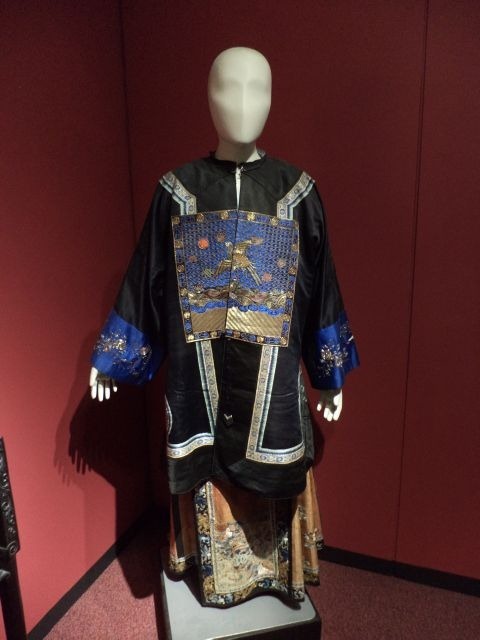 In fact, you can see what they looked like in this garment for a woman of rank shown in Durham University’s Oriental Museum. However, the real ‘creme de la creme’ had panels showing dragons not with four claws but five. This symbol denoted that you were in the imperial family or its staff. So what denotes rank today? In Britain, accent still is a give away but so is dress and possessions. Who hasn’t clocked someone else’s ostentatious designer label, car marque or preference in supermarkets? In the long run probably rank panels, even in the finest silk, would be cheaper.